If you lived in the biblical time of the judges of the Old Testament book of Judges, would you have voted for every one of those judges? That includes Samson by the way. I'm thinking, no. And yet, when you read Judges, you vote for them. You could say that God Himself voted for them -- He raised them up, significant foibles and all. The Bible gives us a basis for interpreting history, because it presents history from God's point of view, which is how we should judge history. I don't see it happening in many cases among professing Christians, and part of it relates to the more effeminate men that I see. They wouldn't like the judges of the Judges period, and would oppose them to their own demise. I see Trump as a judge-like figure of the Old Testament Judges type. I say, Judge like, but pretty close to like them. He himself is not righteous, but he's doing a lot of great stuff for the righteous team, whether he believes in it or not, just like the judges. As you read this, I want you to understand that I know that God doesn't have a covenant with the United States of America. However, when you study the Old Testament major prophets, you read large sections on the judgment of the nations, where God has expectations of Gentile nations with whom He does not have covenant. Those nations, and the United States, are still responsible to God. People can be blessed of God depending upon what they do, because this is still our Father's world. You and I live in an anomaly of history for true Christians, the United States of America. True believers haven't had freedom like this. Jews haven't either for the most part, since the destruction of Jerusalem. It's an amazing time for Christians. However, if you are like me, you see signs in accordance with the rest of history this period of aberration closing. We should not expect it to continue if something isn't done to help preserve it. People like myself see Trump as helping in keeping this window open, even though many professing Christians are aiding in it closing faster, as if they want it. They probably do, because they have very little skin in the game. They think being liked is akin somehow to the love of God in their lives. We are at the end of the year evaluations, and what I read from conservatives is that Trump was good on policy, but not on politics. Okay. The idea here is that if Trump had not been so combative, used social media like he did, because of his policies, his approval ratings would be higher, but his policies are in general what conservatives would want to see. 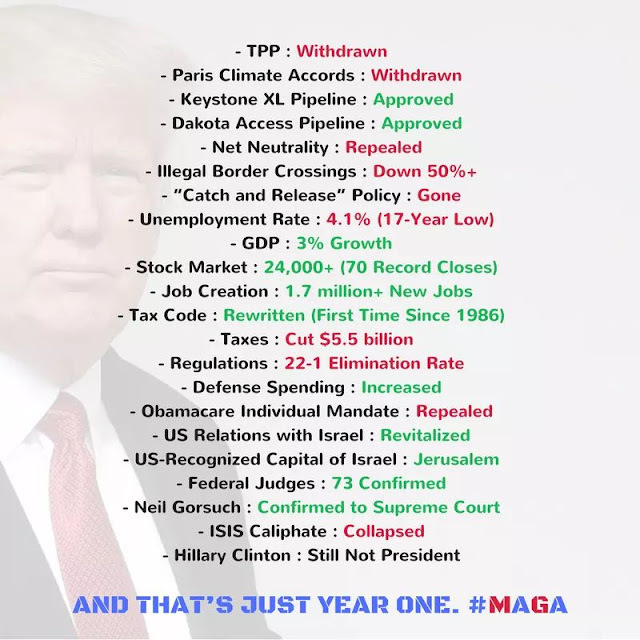 Being forthright, the policies of Trump, although not fulfilling yet everything that he wanted in just less than one year, have been fantastic. He had a narrow majority in the Senate. Trump got amazing things done for having that narrow majority, that everyone knows included many non-supporters on the Republican side. More than any politician in my lifetime, Trump went about doing exactly what he said he would do, attempting to keep promise after promise. This would not have occurred with a Romney, a McCain, a H.W. or W. Bush, or most of the guys running against Trump, probably none of which would have won. They would have been looking for bipartisanship and thought that not getting these things done was somehow a noble deed. Trump's approval ratings according to the Rasmussen poll today, which is the most reliable, and got the 2016 election the closest to right, is 53 disapprove to 46 approve, the same as Obama's after his first year. I believe that Never Trumpers silently like what's going on (in policy), but they can't show approval to Trump in what they act like is a matter of principle. I see their position as a kind of Pharisaical self righteousness, seeing themselves above everyone else, to manifest their own greatness. Some of them perhaps it started out that way, and now they are blinded by a kind of anti-Trump myopia. The Pharisee-ism of Never Trump is that Trump is a bad man with bad motivations and they can't support a bad man with bad motivations, because they are good men with good motivations. The system doesn't work that way, not in a period of the Judges, but they can't understand this. They are utopian in this way, expecting a standard of righteousness that they would never get if they were leaders -- their very nature would be allowing worse than Trump all over the place, and yet they oppose Trump. It's hypocritical in that way too, like a Pharisee. The Never Trumpers are hurting the country. If they were with Trump too, I think his approval would be mid 50s right now at least, maybe more, and he would get more things done faster. They are slowing down good work. They are causing bad. They are missing a great opportunity here that is hurting the country. Trump has his 46 approval (today) without the Never Trumpers, without the left, without the moderates, and without 90 percent of the media. He's got about everybody he could get without all of that. Some of what Trump has accomplished are things that Republicans and conservatives have been saying that they have been wishing for decades. Trump has done them because he is attempting to fulfill the agenda the Never Trumpers said he was lying about. They said Trump was lying and we were being duped. I still hear either silence or just nagging criticism only on the things they don't like. By his actions, he wasn't lying about the things he was advocating. He wasn't taking us for a ride, all the claims that we were hearing if we were supporting Trump. If the Never Trumpers were as good as men as they purport to be, they could admit that and get on board. Trump supporters would forgive them. In general, they are part of the opposition, essentially cutting off their nose to spite their face. As an example of a positive, just a little thing, here in California, we've had some people killed by illegal immigrants, and we are a sanctuary state. The murderers are still living and they spend little to no time in jail. During the Obama administration, the families of the victims had no voice. They got no traction. They wouldn't be listened to. You can include in that the selling of body parts of aborted babies by Planned Parenthood. The Obama administration would have supported that. These families of victims of illegal immigrants are heard by the Trump administration. The previous paragraph is in addition to the obvious, including what Trump has attempted and I don't foresee his quitting on: Gorsuch Supreme Court, conservative judge appointments, United Nations policies, deregulation, support of Christian activity, including the baker in Colorado, his support of police and military, his support of vouchers in education, destruction of ISIS, the travel ban, etc. Just in the last five minutes, I read about a deal with Israel on opposing the work of Iran in the Middle East. Have you noticed the people right now rising up against the regime in Iran? Would they be emboldened like this in an Obama-like environment? These are things that just wouldn't be done in general by another Republican, let alone a Democrat. Imagine any other administration announcing a big cut to the United Nations like Nikki Haley just did last week. He's facing a lot of opposition, including this bogus Russian collusion case. Typical of opposition is news today that in a vacation fishing photo of Jared and Ivanka Kushner and their children and off in the distance is a boat with a confederate flag. This is the fourth estate, the important truth telling of the media. The media reports that they included a confederate flag in the background of their picture. Who else gets this kind of coverage? This influences the many duped leftists, low information voters, and keeps the negativity rolling on the racist and white supremacy lie narrative. Last time I checked, white supremacists weren't Jewish supporters and Jared and Ivanka are practicing Jews. It's non-stop this type of news. Some argue that Trump hurts politics, hurts civility, by the way he acts and tweets. Some would say, if they support him, they would just be encouraging that. I see it a different way. The opposition is carrying a gun to a fight that the normal, establishment Republicans would carry a knife. Trump doesn't stand and take it. Others have tried to get along and just take the hits, to remain in good standing, and they haven't come close to getting done what Trump has been able to accomplish in just a short period of time. He should be judged by these accomplishments, not by the style by which he has done them. Most wish he could use a different style, but in this present environment, we have to look past the style. The combat is what is needed in this climate. Do you think that if Trump changed his style that the media would let him off the hook? Do you think they would stop criticizing him? Do you think they would stop the fake news and stop lying about him and never publish the good things that he has done? It would be worse. I see it this way. Trump knows that his popularity is lower because of how he fights through social media. He does it anyway, because he isn't going to capitulate. He could remain silent like most mainstream Republicans, but this isn't how Trump got where he is. He has never backed down in that way. Trump also knows that he has a higher popularity than what the polls show. He sees it in the rallies he still holds. He has a lot of energy for him from a very dedicated base of voters that are a lot of people. He keeps them together. He's looking for success from his policies to help bring others with him. The faster he can get that agenda on track, the more support he will pick up. If you don't see the corruption of the opposition to Trump, the people who align against him, then you, my friend, are very ignorant. These are some of the most odious people in the country, and you might be someone siding with them against him and what he is doing. They have used about everything they could use to stop him: the race card, the gender card, Hollywood, NY Times and Washington Post, the worst name-calling ever, and a regular fire hydrant spray of lies against him. Almost all of them are sickening. A huge number of them are anti-American, hostile to the core values of this country. They would like to weaken the country for a globalist world view. 9 Absurd Lies of the Media -- Reminds me of some of the anti-Trump who comment here. Here are sites that have listed Trumps accomplishments as president. You can click on each to read them and get an explanation. Based on the examination in the first five parts, the exegesis of John 15:1-11 (cf. v. 16’s use of meno) follows. 1 I am the true vine, and my Father is the husbandman. The Lord here sets up the comparison He will maintain through the following pericope. As the vine is the source of life for its branches, so Christ is the exclusive source and fount of spiritual life and fruit-bearing. The Father, like a husbandman or vinedresser, ensures greater fruitfulness by removing some branches and pruning others (cf. v. 2). 2 Every branch in me that beareth not fruit he taketh away: and every branch that beareth fruit, he purgeth it, that it may bring forth more fruit. The Lord’s statement that branches “in me” can be removed is the best attempt in this text to affirm Arminianism. However, these branches are not those who have been regenerated and then fell away from that state—they are those who were never numbered among God’s elect. All the elect will bring forth fruit, John 15:16, and, since they have the Holy Ghost in them, they will certainly abide, 1 John 2:27, or, employing two of the synonyms of abide in the New Testament, they will certainly continue or persevere in Christ and in obedience. The fact that the Lord refers to these unregenerate individuals as en emoi, “in me,” does not necessitate their genuine regeneration. All the nation of Israel were the seed of Abraham, but the unbelievers were cut off from the nation (Exodus 30:33; Leviticus 19:8; 20:17), so that, while nationally “in the Lord,” only the believing seed is “in the Lord” in a deeper sense (Isaiah 45:17, 24-25). One could compare the interplay in Isaiah’s servant of the Lord image between national Israel, the Israel of God, and the Lord Jesus (Isaiah 41:8; 44:1, 21; 45:4; 49:3-7; 52:13-53:12) or the Lord Jesus as the elect One and Israel as elect in Him (Isaiah 42:1; 45:4; 65:9, 22). The entire nation of Israel constituted the people of God, but in a deeper sense, only the believing Israelites, only the Israel of God, constituted the genuine people of God (Romans 9:6ff. ; cf. 11:20). In the same way, all those who are members of the church are, in a certain sense, associated with the people of God; but they are not all regenerate. The church at Corinth was the body of Christ (1 Corinthians 12:27), but some members of the church were unregenerate (1 Corinthians 15:12, 34; 2 Corinthians 13:5). Since the institution of the local church is the body of Christ, unregenerate church members are part of Christ’s body, and thus are, in a certain sense, in Christ. Such, however, are not truly in Him, not truly united to Him, not genuinely en Christo. Contextually in John 15, Judas has just gone into outward apostasy, having left to betray the Lord to His enemies (John 13:26-30). He had been part of the pre-Pentecost church, that first church established by the Lord when He called the first baptized disciples to be with Him (John 1:35ff. ); indeed, Judas had been an apostle in the Lord’s church (Mark 3:13-19), although he was never chosen to everlasting life (John 6:64, 70-71; 12:4-6; 13:2). The unregenerate “branch” in the Lord cannot bear (pheron, present tense) fruit because it has never had a living connection to Christ (John 15:5). It had an outward, non-living, fruitless connection (and thus the utter pagan is not in view, but the false professor, the unconverted church member), but not a living, genuine connection. Union with Christ always results in a change of life, in sanctification and holiness. Therefore the branch without this living union is “taken away,” that is, it is eventually cut off from even its outward connection to the church and people of God, as Judas was, and is cast into hell. The reference is not to a true believer receiving some kind of judgment; while the verb “take away” is regularly connected to the judgment of unbelievers in Scripture (Matthew 13:12; 21:43; 22:13; 24:39; 25:28-29; Mark 4:15, 25; Luke 8:12, 18; 11:52; 19:24, 26), believers are never said to be “taken away” by God in any of the 102 verses where the verb is found in the New Testament (contrast John 16:22). Those “taken away” are the lost. In contrast, the Father, the husbandman (v. 1, cf. 1 Corinthians 3:9; Isaiah 5:1-2; 27:2-3) works with the branch that is vitally connected to the vine, and by “pruning” him brings about the result of even greater fruit-bearing. The fruit-bearing for the one with genuine spiritual life is certain, as is the fact that the unconverted will not bear fruit and will be cut off. We can see in this verse the perseverance of the saints, by divine grace, and the inability of the unregenerate to persevere (1 John 2:19). Verse two contrasts the false believer, represented by Judas, and the true believer, represented by the other eleven apostles, in the church. One can note as well that it is taking the metaphor beyond what can be justified when an Arminian affirms that the branch that is cast off, representing the person who goes to hell, shows that truly justified people can fall from a state of justification, for the branch that bears fruit—the truly regenerate person, is also “purged” or pruned—which involves cutting off leaves and branches! If the lost man fell away from salvation because he was cut off from the vine, would not the fruit-bearing person be lost as well, because he also is purged or pruned? 3 Now ye are clean through the word which I have spoken unto you. h¡dh uJmei√ß kaqaroi÷ e˙ste dia» to\n lo/gon o§n lela¿lhka uJmi√n. The Lord had stated in John 13:10 that His apostles were clean, but not all; but now Judas having been separated from the church, all to whom the Lord spoke were now clean. They were all washed (John 13:10, perfect tense) through the agency of the word spoken (here in v. 3, likewise perfect tense), so that they were justified by Christ’s righteousness at the point of their faith in His promise, with continuing results in their eternal security. Consequently all that now remained was the work of progressive sanctification, of having their feet washed, 13:10, since they were clean every whit. Clean here and purge in v. 2 are the noun and verb forms, respectively, of katharos. There is a wordplay between the purging/cleansing of v. 2 and the cleansing of v. 3. This demonstrates that the instrumentality of the bearing of more fruit, as mentioned in v. 2, is the Word of God, v. 3, cf. John 17:17. The Word is the “pruning knife” (v. 2) which the Father employs to strengthen the believer to bear more fruit. Saints bear fruit as a result of their living, vital union to the Lord Jesus Christ, through the instrument of the Scriptures, the recorded, perfectly inspired and preserved record of Christ’s Words. God the Father continues sanctifying (v. 2, purgeth) the one who has become clean (v. 3) through justification. See the complete study on meno or "abiding," which includes the passages not only in the KJV but also in the Greek NT (not present in this series of blog posts), by clicking here. The well-known reformed theologian, R. C. Sproul, founder of Ligonier Ministries, some of you readers know died on December 14 this year. I appreciated his defense and exposition of many important aspects of the biblical and historic doctrine of the Christian faith. He impacted much with perhaps his most well known book, The Holiness of God. Sproul has stepped out in what is now considered a bold way concerning objective beauty, defending the transcendentals of truth, goodness, and beauty. In recognition of his recent death, I want to point out his communication of objective beauty as one of the three legs of the Christian faith. He wrote several articles at Ligonier on beauty to expose and defend this foundational element to the right understanding of God. Here are several articles (1 here, 2 here, 3 here, 4 here, 5 here, 6 here, 7 here, 8 here, 9 here, 10 here). He also has done a lot in video (9 part series on beauty, here) and audio (here, here, here, here, and here). I'm not saying he and I agree on everything, but he puts a lot of effort into saying this is something we can and should judge. If there is beauty, there is not beauty. If we can judge something to be beautiful, then we can also judge something not to be beautiful. The premoderns categorized beauty as a transcendental, that is, beauty proceeds from outside of this world and from God. Our understanding of beauty should be based on the holiness and majesty of God and separate from mankind. God defines beauty. I have used the terminology, "truth in the real world," to apply to what God expects everyone to know. It is assumed truth. I wrote a two part series on "effeminate" in a major way to say that we can know what is effeminate. We can judge that. We are responsible to judge what is effeminate and God is judging and will judge effeminate qualities of men. We read the verbiage, "worldly lust," and it is assumed among many other assumptions of God that we know what worldly lust is. If the grace of God that has appeared to all men teaches us to deny worldly lust, we should assume that we can know what worldly lust is. We can't play dumb with that and many other truths in the real world. It is rebellion against God to say that we can't know. Sproul says we can know. I believe he compromises and capitulates, but he doesn't lie and say that we can't judge these things. I admire him for that. What Sproul knows is that people get an understanding of God through what someone is willing to call "beautiful." Whatever it is that people offer God with music says what they believe about God. If what they offer isn't beautiful, that reflects their understanding of God and also shapes their and others understanding of God. I have written here many times that God is shaped in people's imaginations by what God is offered in worship. If it is worldly and lustful, for instance, than that is the perception of God. That has, therefore, become the perception of God. If God isn't God in someone's imagination, then he has a different God. This is a form of idolatry, and it relates to the gospel. God doesn't like or accept everything. We see that throughout scripture. He doesn't like fleshly or worldly lust or that which conforms to the spirit of the age. We can judge that. We have to judge that. If we go ahead and offer God what we like, that He doesn't like, that is our view of God. It is rebellion against the nature of God, His truth, goodness, or beauty. The defense is, you can't judge beauty or aesthetics. That is an attack on truth. We can know the truth in the real world. We are required to know all three: truth, goodness, and beauty. This is the greatest threat of apostasy, people's wrong understanding of God based on the inability to judge. They conform God to their own lust, replacing the true God in their imagination. Sproul says that beauty is not in the eye of the beholder. The eye of the beholder or the beholder himself has become god. Men don't know God because their knowledge of God has been distorted in their imaginations by their perversion of beauty. Today men cannot or won't identify manhood, because that has become perverted. This has occurred to the degree that now someone can self identify his own sexuality. Churches are capitulating here like they have already in music and worship. Churches won't judge worldly lust, fleshly lust, and worldliness, because they say scripture doesn't tell us what they are. They deny the assumption that we can know. The path away from God into apostasy doesn't come mostly from a change in a doctrinal statement, but based upon these issues that Christians today say they can't judge. God expects that we will, so we should assume that we can. WE HAVE NO superstitious regard for times and seasons. Certainly we do not believe in the present ecclesiastical arrangement called Christmas: first, because we do not believe in the mass at all, but abhor it, whether it be said or sung in Latin or in English; and, secondly, because we find no Scriptural warrant whatever for observing any day as the birthday of the Saviour; and, consequently, its observance is a superstition, because not of divine authority. Superstition has fixed most positively the day of our Saviour's birth, although there is no possibility of discovering when it occurred. Fabricius gives a catalogue of 136 different learned opinions upon the matter; and various divines invent weighty arguments for advocating a date in every month in the year. It was not till the middle of the third century that any part of the church celebrated the nativity of our Lord; and it was not till very long after the Western church had set the example, that the Eastern adopted it. Because the day is not known, therefore superstition has fixed it; while, since the day of the death of our Saviour might be determined with much certainty, therefore superstition shifts the date of its observance every year. Where is the method in the madness of the superstitious? Probably the fact is that the holy days were arranged to fit in with heathen festivals. We venture to assert, that if there be any day in the year, of which we may be pretty sure that it was not the day on which the Saviour was born, it is the twenty-fifth of December. Nevertheless since, the current of men's thoughts is led this way just now, and I see no evil in the current itself, I shall launch the bark of our discourse upon that stream, and make use of the fact, which I shall neither justify nor condemn, by endeavoring to lead your thoughts in the same direction. Since it is lawful, and even laudable, to meditate upon the incarnation of the Lord upon any day in the year, it cannot be in the power of other men's superstitions to render such a meditation improper for to-day. Regarding not the day, let us, nevertheless, give God thanks for the gift of his dear son. Some differ that it was a pagan festival to begin. Maybe they're right. I don't know, so I revert back to the position that Spurgeon took. Moses is referred to by name in the 15th century B. C. Hebrew inscription Sinai 361 from the Egyptian mines at Serabit el-Kadhim. Dr. Petrovich's book The World's Oldest Alphabet: Hebrew as the Language of the Proto-Consonantal Script is well worth reading (if you wish to buy a copy, you can save on it by clicking through a portal here). His identification of the proto-consonantal script with Hebrew has provided a number of significant new evidences in favor of the accuracy of the Old Testament or Hebrew Bible, and I am thankful to have been able to utilize Dr. Petrovich's scholarship in my book on archaeology, where the find above is discussed, along with many other powerful historical supports for the accuracy of the Old Testament. Sinai 361 (Cairo Museum); see Romain F. Butin, “The Protosinaitic Inscriptions,” Harvard Theological Review 25:2 (1932) plate 19. Douglas Petrovich, The World’s Oldest Alphabet: Hebrew as the Language of the Proto-Consonantal Script (Jerusalem: Carta, 2016), 169; cf. 158-172. Douglas Petrovich, The World’s Oldest Alphabet: Hebrew as the Language of the Proto-Consonantal Script (Jerusalem: Carta, 2016), 169-172.